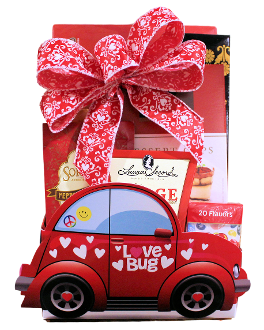 This Mini 'Love Bug' Gift Box contains: Pralines Boxed Chocolates, Chocolate Wafer Biscuits, Chocolate Dolcetto Rolls, Piroucrisp Coffee & Tea Biscuits, Cupido Tirimisu Dessert Cups Chocolates, Peppermint Hot Chocolate Mix, Primavera Gourmet Ground Coffee, Laura Secord Chocolate Fudge Square and Jelly Belly Gourmet Jelly Beans. Presented in a mini "Love Bug" gift box. All of our gift baskets are wrapped in cello and decorated prior to shipping or delivery. We also include your personal message on the enclosure card. We offer local delivery within Fort St. John and Canada wide shipping. Gift Occasions: Valentine's Day, Anniversary, Birthday and many more. Personal, Corporate and Custom Gift Basket Designs. SHOPPING CART: is currently empty.